Customer JERSEY TAXIAPP Question & Answer page. No sorry, the App is the first fully automated dispatching system in Jersey, so we do not employ operators to take phone bookings. This helps keeps our overheads down and one of the reason why we are the cheapest taxis in the island. Besides using our App there is also the 'Book a taxi now' page on this JTDA website which links to the drivers App. DOes IT COST ME ANYTHING TO USE THE APP ? ON WHICH OPERATING SYSTEM CAN I USE THE JERSEY TAXIAPP ? The App is currently available for both iOS, and Android. 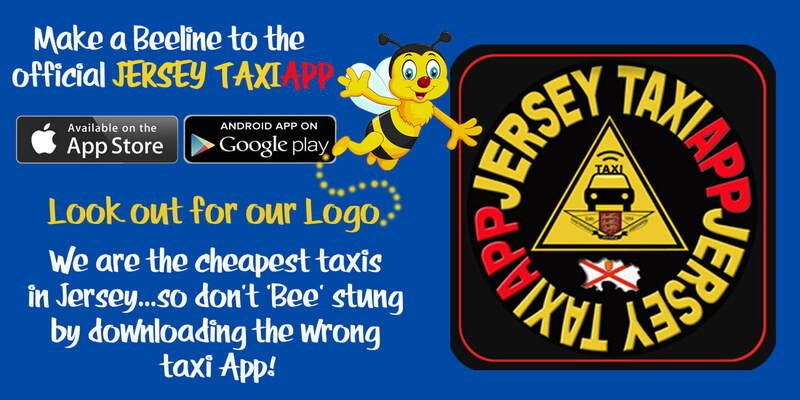 or simply go to our online booking page...Click on the links given below to make sure you download the official JERSEY TAXIAPP. DO I need to REGISTER TO USE THE APP ? Yes, registering means that you get to use and receive all the Apps features, including those important SMS messages and emails to keep you informed about your taxi booking. CAN WE BOOK A TAXI 'ASAP' OR DOES IT NEED TO BE BOOKED IN ADVANCE ? JERSEY TAXIAPP works best for those who need a taxi straight away....however we will be more than happy to accommodate a pre-booked job up to 24 hours in-advance. In the final booking section of our App which is set to 'ASAP' by default, you can make an advance booking by pressing the “Later" icon and then enter the date & time. You will receive a SMS message or Email if your booking was accepted or not within 60 minutes for pre-booked jobs and 15 minutes for ASAP bookings. the app said i had successfully booked, that was very quick, is my taxi now on the way ? ​The app is only acknowledging your booking request, the drivers details will only be provided if your booking is successfully assigned to a driver and then you will receive an SMS message or Email giving the drivers details. (That is why it is so important that you give the right mobile number and email address when you first registered, this can also be changed in account details within the App). We do not always guarantee to successfully allocate a driver for every booking request...'NO' taxi cab operator can do that, but we do have more drivers than any other company on the island so in most cases we will find you a taxi. CAN I FIND OUT HOW MUCH THE FARE WILL BE BEFORE I MAKE THE BOOKING ? Yes, the app will give you a fare estimation based on the the pick up point and drop off location, but the actual fare may differ if changes are made to the drop off location or if the driver has to deviate from the best route because of road works or heavy traffic congestion, the estimation given by the app is worked out by the route you entered but it cannot forecast traffic conditions which can alter the final fare on the taximeter. HOW DO JERSEY TAXIAPP PRICES COMPARE TO OTHER PRIVATE HIRE CAB COMPANIES ? JERSEY TAXIAPP taxis are the cheapest in the island, check out the States of Jersey taxi cab tariffs for price comparisons and you will see that we can be as much as 18% cheaper than other Private Hire Taxicab companies in Jersey...So why pay more! (SoJ Taxi Cab Tariffs). Plus all our taxi drivers have the same controlled tariffs fitted to their sealed meters unlike some Apps who use different taxi cabs companies that all charge different fares. CAN I BOOK A PARTICULAR TYPE OF TAXI, e.g. - 6 SEATER OR WHEELCHAIR ACCESSIBLE (WAV)? Yes you can request a particular type of vehicle in bookings, the default setting is set to 'Any Vehicle' this gives you more of a chance of finding a taxi to accept the booking as it looks at all the taxis available and depending on how many passengers have been entered into the booking, whereas a specified vehicle will narrow the field as it looks for a particular type of taxi. How do i know when my taxi has arrived ? The JERSEY TAXIAPP will inform you when your driver has arrived by sending you an SMS message, you also get a message and email before the taxi arrives, this gives you the drivers first name, make and colour of the taxi and registration number, etc. this information can be really handy if you are at an event where lots of taxicabs have been ordered and you don't know which taxi is yours. but now you will have that information to hand on your smart phone. CAN I BOOK A TAXI FOR MY CHILDREN TO BE PICKED UP ON THEIR OWN AND HOW DO I KNOW THEY WILL BE SAFE ? Of course we will pick up your children as long as they are old enough to travel on their own without adult supervision and know how to behave properly and safely during the journey, this means they must wear seat belts at all times, the driver can provide a single booster seat for any child over the age of 3 years, but a child of that age must be accompanied by an adult and any child under the age of three has to go into a proper fitted child seat which the parents or guardian must provide, without a car seat the driver will refuse to carry the child because of vehicle insurance conditions. Please inform the driver by including any special requirements on the notes in the booking section of the app. All taxi drivers are DBS checked by the Police and DVS and carry public liability insurance to ensure your safety. Yes, but please don't leave it to last minute and you should inform your driver anyway. Abusing the app can result in blocking of your account. do you have a lost property department ? We do not have a lost property department, but we do have a 'Lost & Found' Facebook page, if a driver finds anything in their taxi they will usually look to see if anyone has posted a lost item on that page first or they will hand it into the Police Station. If you booked the taxi through the JERSEY TAXIAPP you could call the driver direct or send an SMS message. Link to our 'Lost & Found' page. ​Can I see the location of the vehicle I booked and when its coming to pick me up? Absolutely! once you confirm the booking on the App and a driver accepts the job you will be able to see the real-time position of the vehicle that has been assigned to you and then you can follow the vehicles route on the map as it makes its way to your location, as well as an estimate of the time it will take him or her to pick you up. You can even share the real time map to perhaps a family member or friend. by pressing the share button at the bottom of App screen and then choose to send the link by email or text message. The map shows my pick up location but not my actual property address ? Google maps does not always give house or business names but locates your position via GPS from your smart phone and displays it on the map using a flag icon, the road location name is then shown in the address bar above the map, it is important to provide the driver with further information than just a road name, to add your address details simply press the pen icon in the address bar, here you can enter your house or business name. if you click the black star in the white circle icon on the map this saves the address you added into favourites, so the next time you make a booking just press the address bar and a drop down box appears with all your stored addresses in favourites for quick easy bookings in the future, this can also be done on the next 'drop off page' so you don't have to do this every time you make booking. If the location on the map is not the location you want to be picked up from simply move the map and wait a couple of seconds for the new pick up location to be displayed and then adjust accordingly in the address bar. On the final 'Make a booking' page there's an extra information box, it is really helpful if you add any further information into this box like directions to help the driver find those locations that might not be shown on the map...Just remember to save your frequently used address names into favourites for easy booking every time. How do i change the language of the the app ? The language of the app is the same language of the phone or device in which it is installed by default. If you change the language of the phone/device, the app will also change to the new language. ​HOW CAN I PAY FOR MY TAXI ? ​JERSEY TAXIAPP drivers all accept cash as well as having card machines in their taxis to accept all major credit cards. ​ No, the booking continues even if you close the app, you also receive a text message when the taxi arrives. If you leave the app open, you can track the taxi's arrival live on the map. Is it possible to book a taxi USING THE online booking tool without creating an account? If you cannot find an answer to you query above you can send an email to info@jtda.org.uk. we will be happy to answer your questions. You can also contact us during office hours Monday to Friday. Please take note that this is for app enquiries only and not for taxi bookings.